Emergency officials in Montenegro say a total of 34 wildfires have erupted around the capital city, Podgorica, forcing firefighters into an all-night battle against the flames. Crew leader Zlatko Blecic said Friday that strong winds and dry greenery hampered efforts to contain the fires. He said the army joined in to help put the situation under control. Blecic says that "this is a record for the night shift, according to our statistics." He says the situation occasionally was critical. Authorities in Podgorica have appealed to citizens to clear their yards of potentially flammable substances and avoid lighting fires in the open. 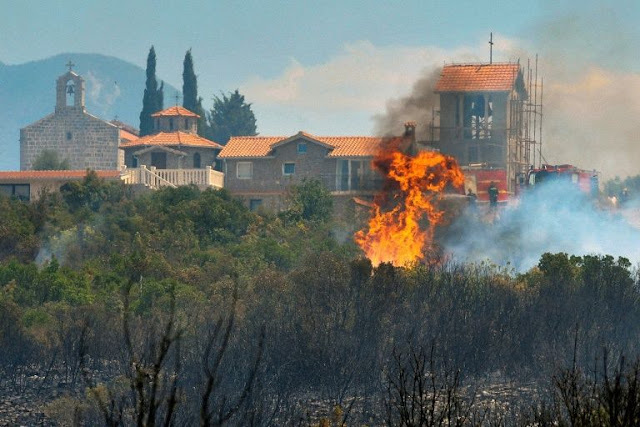 Meanwhile close by Croatian firefighters battled for a full day to control a forest fire along the Adriatic coast that has damaged and destroyed buildings in villages around the city of Split, reaching the Split suburbs late on Monday. Local media reported that the blaze, which started shortly after midnight, has spread across 20 km and first threatened the villages of Srinjine, Sitno Gornje and Sitno Donje. One death has been reported, although it was not clear whether the cause was a heart attack or smoke inhalation. By the evening hours the blaze had reached eastern suburbs of Split. Some parts of the city were without water or electricity. Visitors were asked to leave two shopping malls as the smoke entered ventilation systems. The fire has also reached the city's waste dumping site. Authorities prepared places for some 250 people inside a Split sports hall in case there were evacuations. Citizens were warned not to go near petrol stations threatened by fire on some roads approaching Split. Prime Minister Andrej Plenkovic said that if necessary Croatia might consider asking for help from its European Union partners.